Pylon is a new gateway to the River Nile, the start of a visit. An experience. This experience begins on a boat on Lake Nasser. 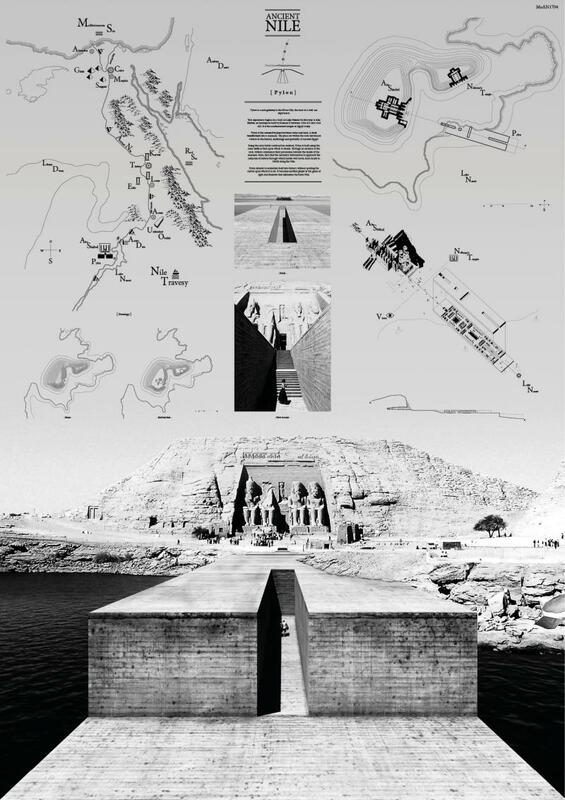 Its first stop is Abu Simbel, an hemispeos built by Ramses II between 1284 AD and 1264 AD. It is the southernmost temple in Egypt today. Pylon is the connective piece between water and land. A dock transformed into a museum. The piece set within the rock introduces visitors to the history, mythology and spatiality of Ancient Egypt. Being the only viable construction method, Pylon is built using the same earth as that upon which is stands. Through an incision in the rock, visitors commence their procession towards the inside of the museum. Here, they find the necessary information to approach the centuries of history through which he/she will travel, from South to North along the Nile. Pylon intends to assimilate itself into history without spoiling the canvas upon which it is set. It becomes another player in the game of light and shadows that delineates the River Nile.